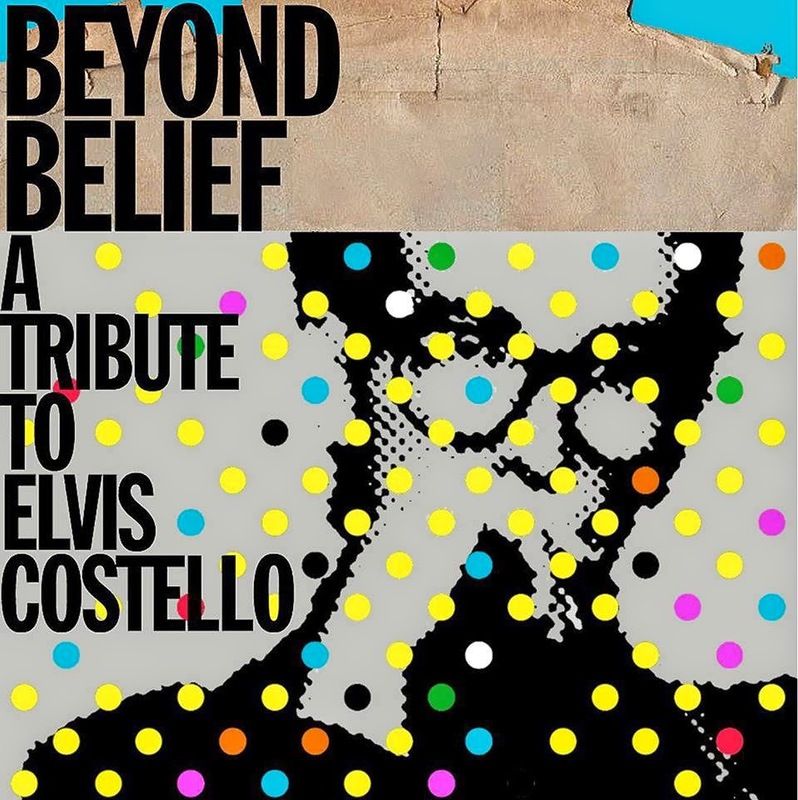 Discussions Magazine Music Blog: SPAZ reviews BEYOND BELIEF: A TRIBUTE TO ELVIS COSTELLO! SPAZ reviews BEYOND BELIEF: A TRIBUTE TO ELVIS COSTELLO! I’ve been a serious music fan for 50 years… and I’m only 51. I’m opinionated, I’m set in my ways and I can be quite ornery. However, I am also completely open to exploring avenues that never cared for first time around. Like AOR – I enjoyed songs by Journey, Foreigner, and their ilk but I was never an active follower of the music until a few years after its heyday. My motto in the ‘80s was “Never trust a band with a moustache and a mullet.” But one day in the late ‘80s, I heard Blue Murder’s “Jellyroll” and I loved it. So, needless to say, I started going backwards and getting into the melodic side of AOR. And I continued to follow the scene as it went underground when Grunge came along. Since then, I’ve been anxious to get my hands on any slice of AOR with a good tune, whether it was popular or not. And that is not good for the bank account. Another change of heart occurred just a few years ago when my avoidance of ‘tribute’ albums was derailed by Andrew Curry’s excellent Drink A Toast To Innocence: A Tribute To Lite Rock, a tribute to the soft rock I loved so much. The market has been so flooded with tributes that they all seemed to be quick and easy money-grabs for labels and artists, but Andrew Curry’s collection felt like a true labor of love. It was about that same time that I came to the realization that I had overlooked so many great indie tributes that had been released in the past. I started to feel like Scrooge being visited by the ghosts of tribute albums past, present and future. Well, if that is the case, then it worked because now I do actively seek out some tribute albums. In 2014, Andrew released another excellent tribute, Here Comes The Reign Again, and that is another slice of audio glory! So, now that my dislike of tribute albums has been cured, I march forward and I no longer approach them with caution. With that being said, there have been titles that I’ve listened to lately that don’t move me. At all. However, there is one that blew my mind and, as you probably guessed, I’m going to tell you about it! I could take the easy way out and tell you that Beyond Belief: A Tribute To Elvis Costello - which was lovingly curated by John M. Borack and Olivia Frain - lives up to its title, but I’m not going to do that. I won’t go into too much detail, either - I’ve already wasted enough of your precious time and that time is best spent tracking this thing down whether you are an Elvis Costello fan or not! To be completely honest here, if I wanted to do the review that this release deserves, it would be a short novel. I’ll just whet your appetite a little and the rest is up to you! There are two important factors that you should know going in – all profits from this release benefit Mr. Holland’s Opus Foundation and that this is a massive three CD release containing 50 tracks. So, the money you spend go towards a great cause AND you get an extremely great value for those well-spent dollars. From the moment Chris Richards & The Subtractions kick into “No Action,” this set is a rollercoaster ride of tracks that run the gamut of faithful renditions to intriguing and interesting reinterpretations. There's plenty of Power Pop to be had, but that is only part of it - you'll also find anything from acoustic ballads to a rock/electro hybrid. So many great ones to choose from including tracks by Gail George (“Deep Dark Truthful Mirror”), Steve Kobashigawa (a fantastic vocal on “Sleep Of The Just”), Nick Heyward (yes, the Haircut 100 man doing “Almost Blue”), An American Underdog (“Crimes Of Paris”), The Rubinoos (“Pump It Up”), Michael Carpenter (“No Hiding Place”), Lannie Flowers (“Radio Sweetheart”), Paul Myers (“So Like Candy”), Sundial Symphony (“God’s Comic” complete with Queen-errific guitar riffage), Matthew Sweet (a lovely version of “Alison”), Corin Ashley (“London’s Brilliant Parade”), Barry Holdship (who effortlessly makes “Possession” sound like a Holdship original), The Popdudes (“Kinder Murder”), Nelson Bragg & Ken Cleveland (“Beyond Belief”), David Myhr (“Veronica”), Throwback Suburbia (“Accidents Will Happen”), Ron Flynt (“Welcome To The Working Week”), Kurt Baker (“High Fidelity”), Severo (“I Hope You’re Happy Now”), Frank Royster (a version of “The Only Flame In Town” that I didn’t care for on first spin but fell in love with by the third! ), Fireking (“Tokyo Storm Warning”) and others. I don’t particularly connect with every single track on this collection, but that’s to be expected on a sprawling, lovingly curated collection such as this. But the reason that I really dig the rest of the tracks, especially the ones listed above, is that they allow me to absorb the songs with a fresh perspective and they actually do remind me what a great songwriter Elvis Costello is and how much I take that for granted… which is the reason for a tribute right? Mission accomplished! Anyone who thinks that a three CD set is a bit too much for a tribute needs to reset their thinking – imagine how disappointed you’d be if they only went with 20 tracks and you knew that there were 30 other great cover versions out there that didn’t make the cut! You’d always be left wondering what they sounded like! And if you really need convincing, just pretend it is a single CD set with two bonus CDs thrown in – you’ll be telling everyone about this great deal you got! So, any negative chitter-chatter is invalid. Love what you love, play what you want to play and rejoice in all the audio magic at your fingertips. Beyond Belief is a triumph for everyone involved! With EC's massive, eclectic catalogue, they could easily out out two more of these.... all three discs. This one is a true gem, in any case. I love it!